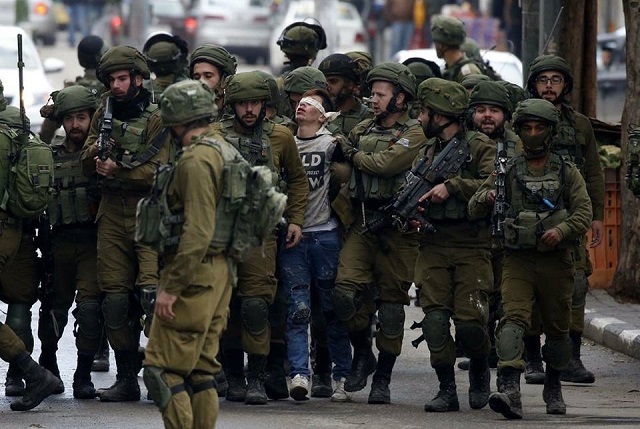 IDF soldiers lead a blindfolded Palestinian boy away at protests in Hebron. President Trump creates his own reality. Climate change is a myth because he thinks it is. Targeting Muslims travelling to the US is not discriminatory. And now he wants us to believe that declaring Jerusalem to be the capital of Israel, overturning decades of US policy that reflects the international consensus, will advance peace. But it is what he didn’t say yesterday that spoke volumes about his position on the status of Jerusalem. In particular, there were two crucial things missing from his White House announcement: first, any recognition of international law; second, any acknowledgement of the rights and legitimate claims of the Palestinian people. In 1980, when Israel attempted to legitimise its annexation of East Jerusalem by passing a bill through the Knesset, the international community acted swiftly to condemn its actions as illegal. UN Security Council resolutions 476 and 478 identified the annexation as a violation of the 4th Geneva Convention and resolved that no States should locate their embassies in Jerusalem. Every State has respected that Resolution and successive US Presidents have, every six months, signed a waiver under the 1995 Jerusalem Embassy Act, which called for the US to recognise Jerusalem as Israel’s capital and relocate its Embassy, thus preventing the process from beginning. In supporting Trump’s decision, Israel and its dwindling allies across the world have pushed the narrative of the historical importance of Jerusalem to the Jewish people and its place as the centre of Jewish spiritual life. These are, of course, true. But it is equally true that Jerusalem is central to Palestinian life, politically, spiritually and culturally. Over 300,000 Palestinians reside in East Jerusalem, which was unlawfully and unilaterally annexed by Israel in 1967, and the Palestinian economy cannot function without the city. In short, there is no viable Palestinian state that does not have East Jerusalem as its capital; a point widely accepted by the international community. President Trump framed his speech as a simple acknowledgement of reality; meaning, surely, the reality established on the ground by Israel through the application of brute force: An illegal 50-year long occupation, the demolition of Palestinian homes, the denial of residency rights to Palestinian Jerusalemites, and the building of illegal settlements— all designed to maintain a Jewish majority in Jerusalem and privilege the rights of Jewish people over those of Palestinians. This is naked realpolitik. The message to the Palestinians is clear: wake up and smell the coffee. Israel has colonised your land and established control over your lives. Accept your fate. However, Trump may have helped remove some of the myths that have sustained western policy-making towards Israel and Palestine for decades: that there is a peace process towards a ‘two-state solution’, one to which Israel is fully committed and which can be achieved without any meaningful pressure on Israel to comply with international law; and that the US can be an honest broker of this process. The reality is that Israel is not committed to the establishment of a viable Palestinian state. This has been clear for many decades, during which Israel has relentlessly colonised East Jerusalem and the West bank whilst paying lip service to the two-state solution. This is true not only of the Netanyahu government but also of the so-called ‘progressive’ opposition in Israel, chiefly represented by the Labour Party. Its Leader, Avi Gabbay, recently opposed the removal of any settlements in East Jerusalem and the West Bank. This week he welcomed President Trump’s speech with great enthusiasm, and proclaimed that Jerusalem would remain the undivided capital of Israel in any future agreement between Israel and Palestine. If Israel is allowed to continue with its programme of colonisation then the reality will be either an apartheid state that privileges the rights of Jewish citizens above those of Palestinians and others, or a democratic state that respects the equal rights of all. The essential message Trump wanted to deliver to the world was that it is time to accept reality. It is indeed, but not in the way he suggests. The reality the world faces is the existence of a 21st century apartheid state; unless we are prepared to act now and start to place meaningful sanctions on Israel.